Is Google Classroom right for you? A team of Notre Dame staff and faculty recently reviewed Google Classroom to see if this new learning management system has potential. We we were encouraged how Classroom tries to simplify creating, distributing and grading assignments paperlessly and how it ties many of Google’s products (but not all) together. However, there were many more things that discouraged us than encouraged us about Classroom. For example, Classroom has no gradebook, no tests and quizzes, no discussion forums, no calendar, no way to connect Classroom to our student information system to automatically create and populate classes with students, and no way to connect to other systems like Piazza or Kaltura using the Learning Tools Operability (LTI) standard used by all the major learning management systems. We really wanted to like Classroom, but this lack of basic tools made us decide that Classroom was not right for us at this time. We will continue to monitor Classroom’s development and possibly revisit this decision at a later date depending on the progress of Classroom’s tool set. If you would like to read our review of Google Classroom, please visit this link to our report in Google Docs: https://docs.google.com/document/d/1RAahDVstuCLMyNOD7ImAfkVTcDN2mkRYph5Nubg5Jss/edit?usp=sharing. Project Tango is a line of Google smartphones and tablets featuring the ability to accurately track position in space with a new depth-sensing camera. Tracking position on a traditional smartphone is limited and has a large margin of error, making the technology largely unreliable in this application. The unique camera on Project Tango devices allows them to “see the world in 3D,” taking photos that capture the distance from the camera rather than capturing color for each pixel. Project Tango devices track movement of objects in the camera’s frame. Because of this, they can accurately estimate how the camera must have moved to cause objects to shift in this way. The tracking ability in the Project Tango devices opens up exciting new possibilities in a variety of fields. “At Academic Technologies, we are very excited about Project Tango. It is extremely promising technology, and quite easy to program for,” says Ryan McGrail. Ryan has been leading the exploration of Project Tango at Notre Dame, and is in the early stages of understanding the device and its potential. “I am quickly discovering how I can apply these new features to the apps we create. It is a very well-built device, and lends itself to imaginative implementations in our apps,” he says. Ryan has also observed shortcomings of Tango. The 3D camera is not effective for scanning objects in the distance, or outdoor environments. If the camera is obscured, it attempts to interpret motion from a black image. This can lead to inaccurate data. “The good aspects of these devices far outweigh their problems,” Ryan says. He believes that the kinks observed in the developer version of Tango will be worked out before the devices hit the market. Currently, Ryan is using Tango in a partnership with Notre Dame’s architecture program. They are developing a blueprint-reconstruction tool that would allow the user recreate a space inside a Tango device by simply walking around the building. The 3D model created with Tango easily translates into blueprints of the space, and can be imported into architecture programs. Beyond this current project, Ryan sees vast potential for Project Tango at Notre Dame. “Tango can be used as a handheld frame to see the world…We could use the devices to map out buildings on campus, such as the main building. With the models saved to a few Tango devices, Notre Dame admission officers could take them around the country, and allow prospective students to “walk” around the buildings for themselves.” Tango could also be utilized in the classroom, creating an opportunity for instructors to virtually bring students to a museum on the other side of the world, or for designers to see their work come to life. “The possibilities are truly endless, and this is just one of the simplest ways to implement Project Tango,” Ryan says. We look forward to continuing to explore the Google Tango technology, and will keep you updated as we progress. “We want to bring fans a perspective they have never had before,” Aaron Horvath says, “giving them a brand new, more exciting game day experience.” Horvath is part of the team at Notre Dame Athletics that is partnering with OIT to bring Google Glass technology to campus. The softball, football, and cheerleading programs have been exploring how Glass can change the athletic experience at Notre Dame. The women’s softball program is one of the pioneer teams in exploring the opportunities of Glass on the field. The team has used Glass on the batter to get firsthand footage of fastballs and home run swings. The technology is also being used in football. It has been put on the leprechaun at home games, bringing fans right to the center of the action. Fans are immersed into a sideline view of the field, as Glass captures exciting game day moments up close. The major advantage of using Glass is that it can capture footage in places that a traditional camera cannot. Notre Dame has used the unique footage recorded by athletes and the leprechaun in promotional material and YouTube content. It has been successful thus far, as both fans and student athletes are excited about using high tech eyewear on the field. It also appeals to prospective athletes, demonstrating Notre Dame’s desire to stay at the forefront of integrating the latest technology into athletics. The potential of Glass raises interesting questions in the Notre Dame community. Where does Glass provide an advantage over traditional cameras? How can we use it to better tell our story? Horvath and his team are also looking into the future potential of Glass for coaches and recruiters, allowing them to see where players are looking, and give a different view of technique. The full potential of Glass will continue to be explored. In the mean time, fans can sit back, relax, and enjoy their front row seat. The Drop Box tool in Sakai allows instructors to connect with students’ homework using the iAnnotate PDF app on a tablet. Instructors can mark feedback and corrections directly on the document. By utilizing this tool, assignments can be graded and returned digitally. To use the system, the professor needs to have an iPad or Android tablet available. Students need to submit work through the Drop Box portion of Sakai. The WebDAV protocol is used to connect the file with the iAnnotate PDF app. On the iPad, WebDAV URL and authentication can be entered directly in the app. For Android, a WebDAV app must be downloaded. Once the assignment is loaded in iAnnotate PDF, it can be directly marked, highlighted, commented on, and saved. Paperless grading is more cost effective, uses less resources, and requires less paper storage than traditional grading. Students receive feedback more quickly than waiting for a paper copy to be returned in class. Class presentations can be graded as they happen by marking a blank rubric and saving it directly to the student folder in Drop Box. By more efficiently grading papers, the instructor has more time to work with students or focus on research. iAnnotate is used by a large number of higher education institutions around the world. However, this application of the app in conjunction with Sakai has not been seen beyond Notre Dame. The method is currently available to Notre Dame faculty. If you are interested in learning more about paperless grading, contact Kevin Abbott at 574-631-8707 (kabbott@nd.edu) or Chris Clark at 574-631-7434 (clark.96@nd.edu) to set up a meeting. Skype was first released in 2003. It allows users to communicate by voice through a microphone, video by using a webcam, and instant messaging over the Internet. Skype has a wide array of uses, and has proved valuable in the higher education classroom. Over the past few years, Notre Dame has seen an increase in the educational use of Skype. Professors have used it for teaching remotely while attending a conference, recovering from an illness, stranded by weather, or participating in research abroad such as at the CERN European Laboratory for Particle Physics. It has also been used to connect guest experts with the class. Recently, Skype was used for a call with a topic expert at the U.S. State Department. Students can actively participate, as the speaker is able to pick up questions from about twenty feet away. Skype has allowed faculty and students to communicate and connect in ways that would have been impossible or very costly prior to 2003. To continue to encourage this communication and connection between faculty, students, and outside experts, the University has created two Skype kits. Each kit contains all that is needed to hold a Skype video conference: a laptop, speakerphone, and web camera. Currently, these units are being tested with faculty. By the spring 2015 semester, there will be two of these kits available for checkout from 115 DeBartolo Classroom Building. If you are looking for a way to remotely connect with your class while you are conducting research abroad, or if you like the idea of bringing an expert into your class remotely, please contact us in Academic Technologies for assistance in using the Skype kits. We ran an experiment yesterday with the Neurosky Mindwave Mobile Headset and used the Puzzlebox Orbit helicopter for a portion of the experiment. Our goal was to better understand how the headset worked with live participants in an experiment situation. We are still gathering the data at this time, but will publish the unscientific results on this blog in the near future. Our experiment consisted of 3 separate tasks set to test whether certain activities would enhance the attention/focus of the participants. Each task involved a Braingle.com memory test (the word test) and two of the tasks had brainwave information recorded for the participants using NeuroSky’s Recorder app. We used the iPad for each task — two of those tasks were for recording brainwave data and the other for operating the Orbit helicopter. 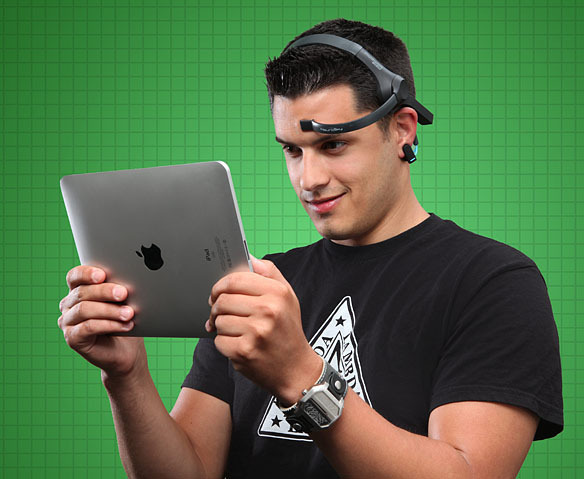 We found five willing participants who had never used the Neurosky headset nor the Orbit helicopter. So, for our N=5, we won’t be able to derive too much from the results, but we will be able to learn how to set up experiments for the headset and helicopter in the future which will be invaluable. So, stay tuned for our unscientific results! We love it even more when someone else has one and lets us use it. Often times you want to make a video to illustrate a point. Ideally it would feel like a discussion. You’re facing the viewer and explaining something to them. You’re not facing a chalkboard or a whiteboard and turning your back to them. It feels natural. Let’s state right off the bat that this is not our idea. It’s called the light board and it came from Michael Peshkin at Northwestern University. The Lightboard Home Page is really incredible and gives you all the details you need to make your own copy. Parts list with numbers and links, diagrams, technical details, etc. It’s open source hardware so he encourages you to make your own, experiment, etc. Just share what you’ve done. We’re kind of space constrained and there’s very little available space on campus. While we think this is a great idea, we’re going to need to be able to show people how this works in order to get the funding and square footage required to make it a reality. Instead of making a 4×8 board, we made one that was 3×4. Still big enough to be useful but small enough we can find a place to demonstrate it. It’s also cheaper than a full size unit. Ordering the glass is pretty easy due to the well detailed specifications. To build the frame we worked out a design and ordered a bunch of 80/20 aluminum. Assembly took a couple hours. The box actually said it was an erector set for adults. We were too excited to worry about the lousy lighting! There are LED lights underneath the edge of the glass that cause the text to really pop out of the glass. Since it was a 16 foot roll, I had about 12 feet extra. Part of the challenge in this project is to illuminate the presenter and not add glare. I took the extra 12 feet and stuck it on the glass. I’d say it does a great job of illuminating the instructor. I also took a few accent lights we had laying around and used them as a key light. Not bad for a beta test! Overall, we’re thrilled with the effect. It’s really much more pronounced than it appears here. We still have a lot of tweaking and testing to do but I think we’ve established the feasibility of the system. Now we start showing this thing off and we’ll see if we can get a 12×15 room to really do this right! Michael Peshkin at Northwestern University. Obviously! Our colleague David Seidl for bringing it to our attention. He’s really interested in that whole maker-space culture thing. Apparently he saw it as a post on Hack A Day. Tim Cichos in Notre Dame Learning Spaces who helped us engineer the frame. Live streaming academic events using Wirecast software on a laptop connected to the Ustream hosted service. We have developed the following applications using Kinect: control of interactive, panoramic photography using Gigapan and Microsoft DeepZoom; control of PowerPoint, including annotation of slides; and control of 3D objects in Chimera.